The last roll of the SandForce dice? Corsair doesn't mess about when it comes to solid state drives. It seemingly doesn't matter what sort of configuration you want, you can pick one up from the former memory maestro. I say 'former' only because Corsair has branched out so far that only motherboards, GPUs and CPUs are outside its product range right now. Do you want a SandForce controller or do you want to side with Marvell? What sort of capacity are you after? What style memory is your bag: toggle, synchronous or asynchronous? Whatever, Corsair has you covered. It's also a big enough company to be able to really drive down prices. That this drive is selling at a 70p/GB rate is incredible considering £170 was the price of a 120GB drive barely a year ago. This Force GS is much like the previous Force GT, in that it's a pretty red and is running the ubiquitous SandForce SF2200 series of memory controller. What's different is the kind of memory that's strapped into that controller. 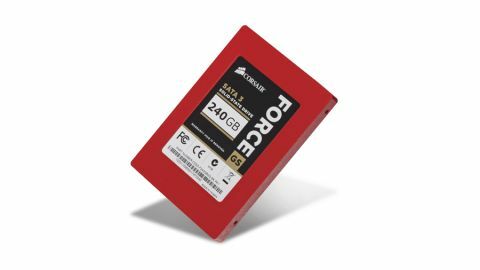 The Force GT comes with the synchronous style of NAND - the same as in the Marvell-powered Performance Pro - while the Force GS is chock full of the fancy Toggle NAND. Toggle switch Synchronous NAND was dropped into SSDs to help offset the performance drop-off that SandForce drives suffer when it comes to incompressible data. Toggle NAND offers a similar service to SF-based drives, though is meant to be slightly faster. While the Force GT still suffers from a large drop-off in write performance with incompressible data, the Force GS does a little better at managing the decline. That said though it still falls short of what the Marvell and Indilinx-powered Performance Pro and OCZ Vertex 4 manage with their different controllers. For compressible data, the Force GS has some serious straight-line performance chops, hitting 558MB/s and 536MB/s in sequential read/write speeds. The Vertex 4 falls just short of those scores in terms of read performance, but loses out in write performance and burst speed. Still, that's a much more stable drive when it comes to dealing with different kinds of data. So it seems it's actually the Vertex 4 then that the Force GS is completing against, not its Force GT sibling. That follows in terms of pricing two with both the 240GB Force GS and 256GB Vertex 4 coming in at around £170. Though as the Indilinx controller doesn't require the same over-provisioning as SandForce versions, there's a little more capacity available, driving down that price/GB metric in favour of the OCZ drive. In terms of Corsair drives, the Force GS is the winner, with good straight-line speeds and excellent random writes. It manages the incompressible writes drop-off better than its stable-mates and the other SandForce drive too, especially those with asynchronous NAND memory. Still, the OCZ Vertex 4 remains king. It has improved random writes and more reliable performance speeds. For the money we'd have to go with the OCZ drive, but it's a close run thing.